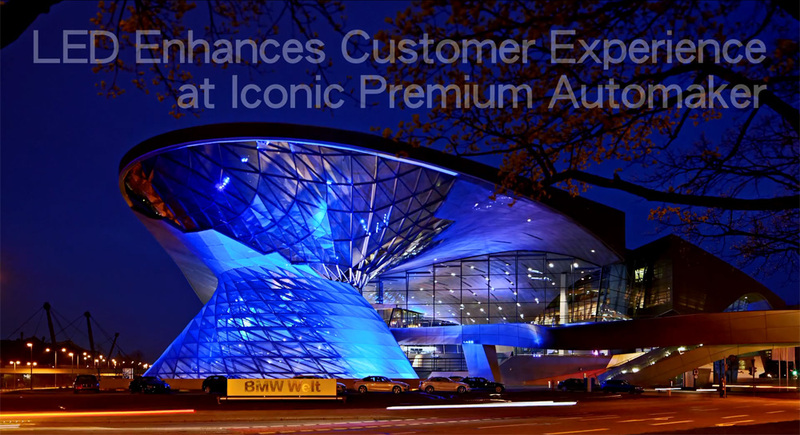 As one of Munich’s most popular attractions, BMW World is a unique and extremely important showcase for the premium automaker. Whether visiting BMW World as a tourist, or there to pick up a brand new car, BMW World offers an extra-ordinary brand-experience. BMW World has featured eye-catching Martin color illumination on the outside of the building for years, a dynamic lighting scheme that has now been extended indoors as a daylight solution. As one of the world’s great luxury automakers, the atmosphere surrounding presentation of the various car models must be perfect. Therefore, especially high demands are put on the lighting environment. An extremely even daylight illumination is required, a uniform level of light that must be guaranteed no matter the ambient conditions, time of day or time of year. Martin Professional LED-based Exterior 430 luminaires have been installed and produce optimal results, meeting the highest standards and requirements of luminosity and color rendering at BMW World. For more, view a video of the BMW World illumination here.